Its compact size contains an isolated input system which ensures that signals are not corrupted by inputs to other channels, thus eliminating wiring concerns. The GL220s multi-type inputs are suitable for voltage, temperature, humidity, pulse, and logic signals, enabling combined measurements of different phenomena like temperature/humidity and voltage. Utilises a bright clear 4.3-inch wide TFT color LCD monitor (WQVGA: 480 x 272 dots). 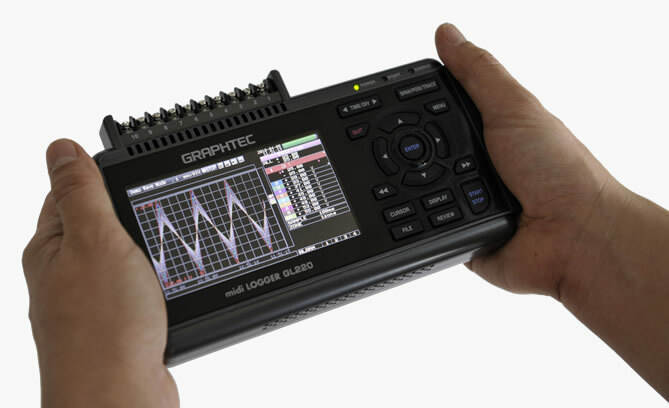 Makes it easy to read data in waveform or digital form and to check your measurement parameter settings. The background color of the screen can be set to black or white. Also supports popular USB memory sticks for external storage. The GL220 saves measured data directly to USB memory sticks. USB memory sticks can be replaced during measurement without data loss. Ergonomically designed and easy to operate, just like a mobile device. The input/output terminals and keybord layout are arranged so that it can be operated in hands-on mode even when recording data. Chose from AC supply, DC supply or the optional battery pack which enables 6 hours*7 of continuous measurement. The power source is automatically switched to the battery pack when the AC power supply is interupted. If the capacity of the battery pack goes low then measurement is automatically terminated and the captured data file is closed and protected.